We are thrilled for our president and owner, David L. Kirtland, who received The Dr. David J. Gray ’50 Medallion on Friday, May 18th at the Keystone College Donor and Trustee Recognition Reception! The Dr. David J. Gray ’50 Medallion is awarded annually to a member of the community who exemplifies commitment to higher education. We couldn't be more proud! To learn more about David and his wife Marijo's mission to empower higher education students, please visit https://kirtlandfoundationscholarship.org/. Diamond K Incorporated is searching for an experienced, professional Yard Jockey with dedication and integrity. This position is located in the Greater Scranton/Wilkes-Barre, Pennsylvania area. The selected associate will be responsible for the effective daily coordination and movement of inbound containers and outbound trailers. Timely movements and thorough knowledge of on-site inventory and positioning will be expected. Other duties include fork lift driving and general warehouse work, as well as over-the-road account pickups. Hours are Monday through Friday, with some Saturdays. This position offers competitive wages and excellent benefits. This is an outstanding opportunity to join a strong team of dedicated and knowledgeable employees. If interested, you can apply directly to diamond@dk-t.com. We would like to publicly congratulate and thank Thomas Chesik, our April 2018 Employee of the Month! Thomas was recognized in April for his outstanding contribution to Diamond K Inc. We applaud his dedication and commitment to excellent work! 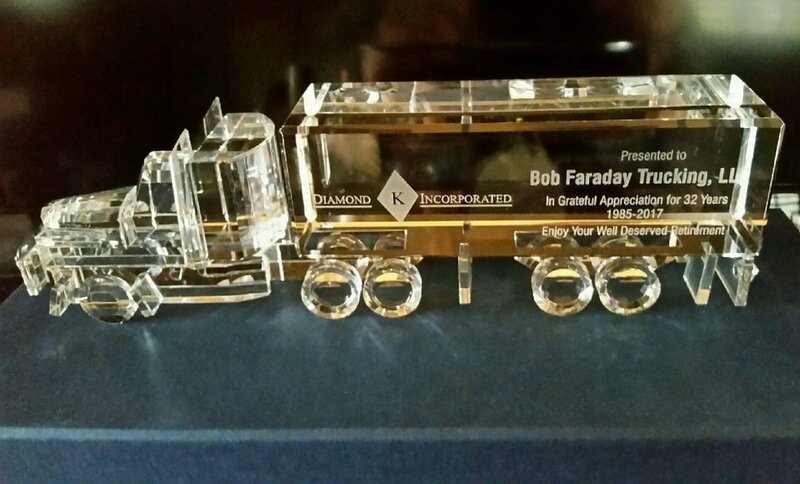 Thank you for being a great assett to Diamond K Inc.
We would like to thank Bob Faraday for his 30+ years of service to Diamond K Inc.! Bob was an independent truck driver for us who recently retired. He is pictured here with his wife, Debbie, and our president and owner, David L. Kirtland, at our quarterly safety luncheon where he was honored. We were privileged to have had such a dedicated and hard-working employee working for us for so many years. Thank you, Bob! Congratulations, Robert Cullen, on being named our March 2018 Employee of the Month! Thank you for your positive attitude and for being so committed to Diamond K Inc. You are a great asset to the company and your hard work does not go unnoticed! Keep up the great work. Diamond K Incorporated is searching for an experienced, professional truck driver with dedication and integrity. This position is located in the Greater Scranton/Wilkes-Barre, Pennsylvania area. The selected associate will be responsible for local pickups and deliveries. This position offers competetive wages and full benefits. No overnight travel - candidate will be home every night. This is an outstanding opportunity to join a strong team of dedicated and knowledgeable employees with the opportunity for both professional and financial growth. You can apply directly to diamond@dk-t.com, or check out our listing on Facebook. 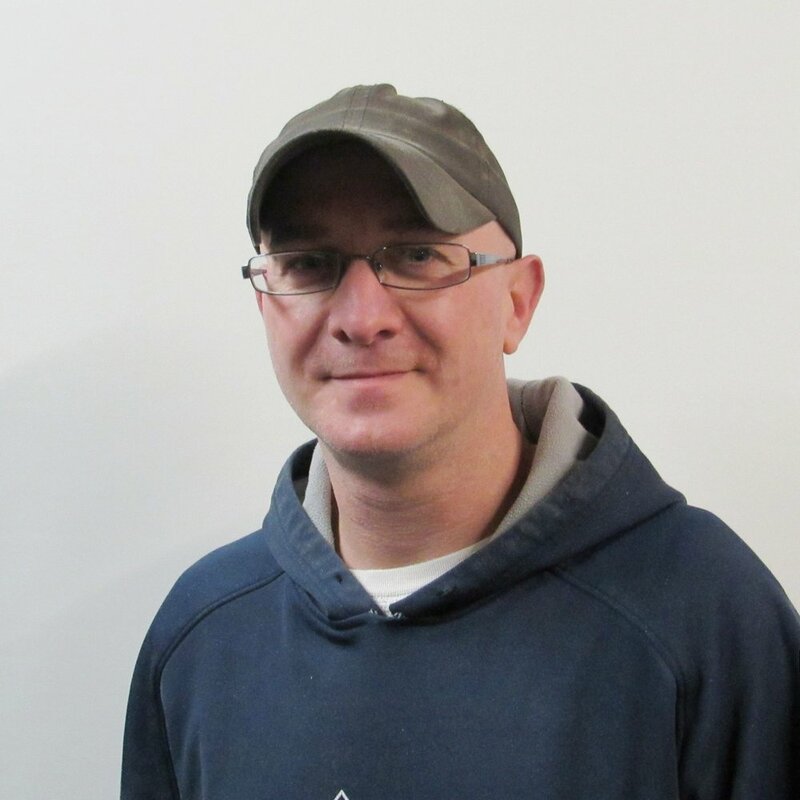 Special thanks and congratulations to Robert Casey, our February Employee of the Month! An Employee of the Month is someone who exemplifies our values, goes above and beyond to do great work each day, and sets a great example for other team members to follow. Bob does all of this and much more, and we couldn't be happier with his hard work and dedication to Diamond K Inc.! The following article was originally published in The Times Tribune. Think twice before tossing that yogurt cup in the blue bin. It’s recyclable, yes, but any goo left on the bottom is tainting a global industry. Industry experts say single stream recycling, or mixing aluminum, glass, paper and plastic in a single bin, is contaminating huge chunks of valuable material. Last spring, the Chinese government’s National Sword 2017 policy set tighter rules on what the world’s largest recyclable material importer will accept. The policy also sets a high bar for material cleanliness in an industry already subject to dramatic price swings. Kirtland said in the time period around June to December last year, the price for some paper products could rise and fall by $100 per ton in a month’s time. “That’s not the norm, but it’s really a commodity business, and 49 percent supply and 51 percent demand sends the price up,” he said. His company packs and ships 10,000 tons of paper and cardboard every month. His brokerage company, DK Trading Corporation Inc., buys and sells about 25,000 tons a month. The problem comes down to cleanliness. With single stream, unwashed yogurt cups and beer cans get stirred in with high quality white office paper, one of the most valuable of recyclables, and ruins it. “Domestically, single stream, for all intents and purposes, is almost rendered useless because there are so many contaminants in the products,” Kirtland said. Industry experts are at odds about whether the benefits of single stream outweigh its harms. Advocates say it makes residential recycling easier because you need fewer containers, said Beth DeNardi, Luzerne County’s recycling coordinator. It costs less for towns, especially if they pay public works employees for curbside pickup, she said. It’s hard to compare one county to another, she said. Each town has a different budget, population and requirements from the state. Berit Case, the state Department of Environmental Protection’s regional recycling coordinator, said all towns in Lackawanna and Luzerne counties under a mandatory recycling rule are in compliance. No towns in the surrounding counties meet the 5,000-resident population threshold for mandatory recycling programs. The 11 counties in the DEP’s Northeast region generated nearly 3 million tons of recyclable material in 2016, according to the most recent data from the DEP. Brandon Wright, spokesman for the National Waste & Recycling Association, said his organization encourages single stream recycling because it increases participation. He also recognized that recyclers have a harder time selling it under China’s National Sword. In Diamond K’s 125,000-square-foot baling and packaging operation in Scranton’s Providence section, crews use skid steers to push shredded paper onto a heavy conveyor belt. The shredded stuff rides up to a chute to the baler, which packs it into neat cubes weighing 3,000 pounds apiece. He buys his waste material from publishers and factories, but much of it arrives from sources where it accumulates one slice of paper at a time. Those sources are more likely to deliver contaminated material than industrial sources. He’s told many of his vendors that he’s not interested in their scrap if they switch to single stream. Barbara Giovagnoli, Lackawanna County’s recycling coordinator, encouraged companies to write their own good-steward policies, for example, separating paper from cans and plastic. She also recommends those in office settings to put trash cans in a central location and recycling bins at every desk. Towns with more than 5,000 residents, and the individual businesses that operate in them, are required to have recycling programs, according to Act 101 of 1988. Under the act, commercial and municipal establishments must at least recycle aluminum, high-grade office paper and corrugated cardboard, in addition to other materials chosen by the town. Mandated municipalities must collect at least three of a number of items, including glass, plastics, aluminum and newsprint. No towns in Susquehanna, Wayne or Wyoming counties meet the population threshold. At the very least, recycling can cut down on waste disposal costs. This is true for households that pay per bag for garbage disposal and large corporations with dumpster service. Companies trade recyclable material in large volumes, but the amount produced by a small company or home may not produce any financial benefit. Large companies that produce a lot of, for example, high-grade office paper, can sell it. Archbald, Blakely, Carbondale, Clarks Summit, Dickson City, Dunmore, Moosic, Old Forge, Olyphant, South Abington Twp., Scott Twp., Scranton, Taylor. Dallas Twp., Exeter, Hanover Twp., Hazleton, Kingston, Kingston Twp., Nanticoke, Newport Twp., Pittston, Pittston Twp., Plains Twp., Plymouth, Swoyersville, Wilkes-Barre, Wright Twp. Congratulations and special thanks to Fran McDonnell, our final 2017 Employee of the Month! An Employee of the Month is someone who exemplifies Diamond K Inc.'s core values, performs to the best of their ability each day, and sets a great example for other team members to follow. Thank you, Fran, for always going above and beyond! We are thrilled with your hard work and dedication to Diamond K. Inc.! As we close out 2017, we would like to thank all of our employees for a fantastic year. Special thanks to those 12 dedicated workers recognized as our Employee of the Month this year! Congratulations to Bob Gohsler, our November Employee of the Month! 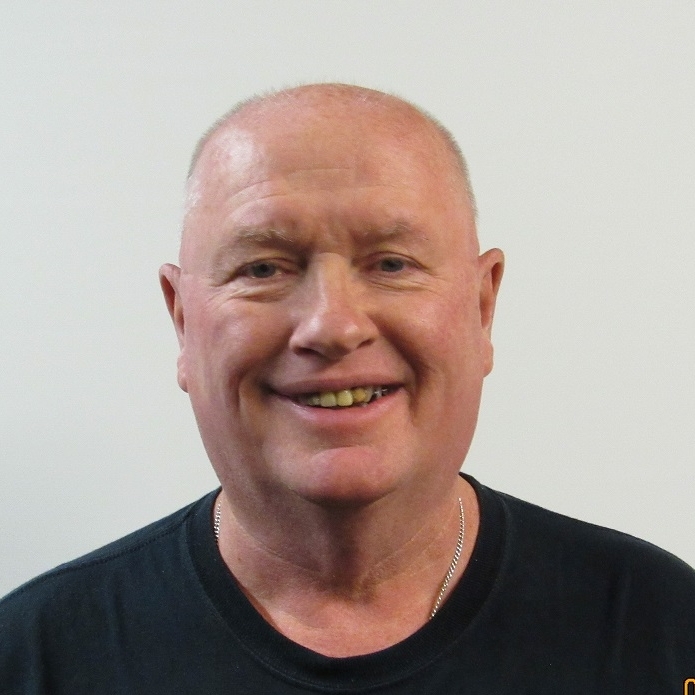 Bob is a valued member of our team, and we are thrilled to recognize him for his service. Bob, we are truly thankful for your efforts and contribution to our company! We are pleased to announce Matthew Krenitsky as our October 2017 Employee of the Month! Matthew's enthusiasm and interest in the company have made a huge impact to our success. We recognize and appreciate Matthew's dedicated efforts and are grateful for his service! Congratulations to David Schwartz, our September Employee of the Month! David was recognized last month for his outstanding contribution to Diamond K Inc. We applaud his dedication and commitment to excellent work. Thank you, David! Don't miss out on this county-wide tire collection event! You can recycle your used tires next week, Wednesday through Saturday. Full schedule pictured below! We are proud to announce our August 2017 Employee of the Month - Gerald Shoemaker! Gerald, we applaud you for your extra effort, dedication and insight, all which are extremely valuable to the success of Diamond K Inc. Thank you for all your hard work! Congratulations to our July Employee of the Month, Paul Williams! We appreciate the effort and the time Paul has given to Diamond K Inc. and recognize his great enthusiasm to learn and grow professionally. Thank you, Paul, for your work and conduct! Congratulations to John Eisenhaeur, our newest Employee of the Month! John was recognized in June for his outstanding contribution to Diamond K Inc. We applaud his dedication and commitment to excellent work. Thank you, John!